David Quiggle, viola. Born in the Pacific Northwest, American violist David Quiggle now lives in Spain, where has been a leading violist, chamber musician and teacher for more than 20 years. As a member of the Casals Quartet he toured Europe and South America, and won top prizes in the London, Hamburg, and Paolo Borciani string quartet competitions. As a member of the mixed chamber music ensemble, La Bande de la Loingtaine, he has performed in France, Belgium Singapore and Japan. He has performed in chamber music festivals across the globe, and recent solo performances include the Bartok Viola Concerto with the Simon Bolivar Youth Orchestra of Venezuela, Hindemith´s Der Schwanendreher with the Medellin Philharmonic, and Mozart’s Sinfonia Concertante in Madrid and Valladolid with violinists Gordan Nikolić and Alina Ibragimova. He is one of the founders and the principal viola of bandArt, and has been a frequent guest principal with groups such as the Mahler Chamber Orchestra, Malaysian Philharmonic, Barcelona Symphony Orchestra, or the London Philharmonic. In 2016 he led the violas of the Chamber Orchestra of Europe in two European tours, with conductors Yannick Nézet–Séguin and András Schiff. David studied violin, viola, and string quartet at the Vancouver Academy of Music, the New England Conservatory, and the Musikhochschule of Cologne. His teachers include Walter Trampler, Gwen Thompson, Walter Levin, Louis Krasner, Eugene Lehner, and the members of the Alban Berg Quartet. When not playing classical music, David actively explores other musical genres, which has led to collaborations with many of Spain´s leading musicians and dancers. Since 2006, David has been working with the SaludArte Foundation on projects that include concerts and workshops for people with special needs, in situations of social exclusion, or in hospitals or prisons. In collaboration with SaludArte, Lisarco Dance, and the New World Symphony, he took part in the collective creation of Synergy, a show for four musicians and five dancers that includes functionally diverse artists. Synergy was premiered in June of 2013 at the Museum of Fine Arts, Houston, and since has been staged in Barcelona, Valladolid, Madrid, Miami, Jerusalem, and Ramallah. 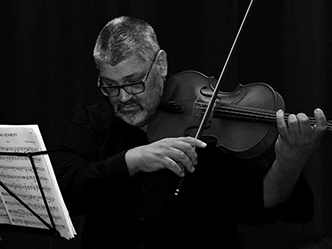 David Quiggle has coached youth orchestras in Spain, France, Venezuela, Colombia, Japan, Korea, Singapore, and the USA, and was viola teacher for ten years at the Musikene Conservatory in San Sebastian, Spain. After a recent two-year stint in the USA teaching viola and chamber music at Ithaca College, in fall of 2017 he returns to Europe to take up the position of Principal Viola with the London Philharmonic Orchestra.